Brand New - Never Been Lived In 12 Plex in Westmount! 2 Storey Coach-Home Style Units! Enjoy the luxury of brand new everything inside and out! Be the first to live in these beautiful modern units! 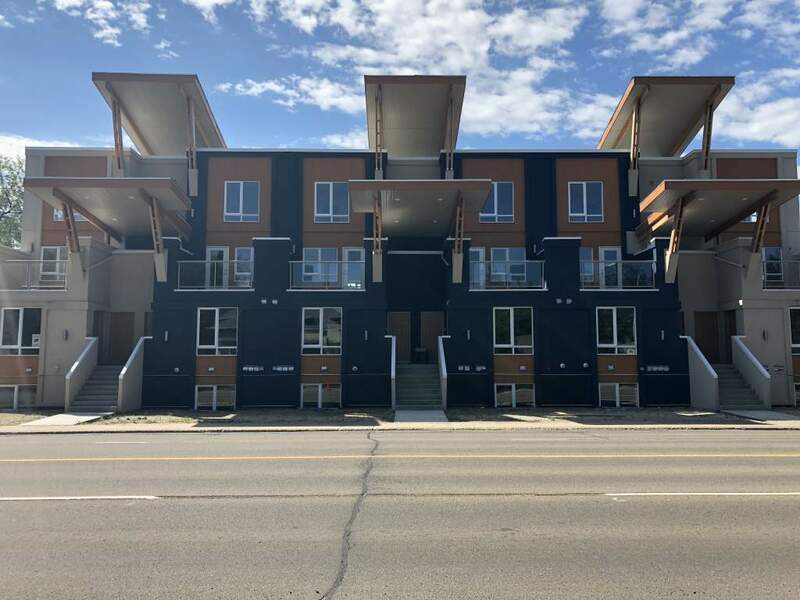 Conveniently located along 111 Avenue in the rapidly developing Westmount community, this 12 Plex offers proximity to NAIT, Macewan University, Kingsway Mall, Westmount Centre, Royal Alexandra Hospital and even multiple LRT Stations! Getting anywhere is a breeze in this neighborhood as major transit routes are all around, including 109 Street and Groat Road! This is an amazing location for professionals especially those who work in the Downtown core! With two unit types to choose from, there is a layout perfect for everyone! Each unit comes with all appliances including stacked front-loading laundry machines as well as their own utilities, which means your own furnace and hot water tanks! One outdoor off-street parking stall is also included in the rental amounts. The upper level units take you up a large stairway to the amazing open concept living, dining and kitchen space. With stunning laminate flooring, massive windows and modern accents this floor plan is sure to impress. The large living is filled with natural light and offers access to a large north facing balcony, while the spacious kitchen which features dark cabinetry, beautiful quartz countertops and stunning stainless-steel appliances. This kitchen truly has everything you could imagine including soft close cabinets, gorgeous tile back-splash, tile flooring and even a small countertop overhang perfect for a breakfast bar! Off the kitchen is a large dining room area with an overhanging light and large window, making for a perfect dinner party space! The main floor level is finished with a small under-stairs storage space and a beautiful half bathroom. Continue to the upper level and find a large den space, perfect for a small office along with two massive bedrooms. The master bedroom boasts a walk-in closet with built in closet shelving along with a huge private ensuite bathroom, which features his/her sinks and a large tub shower. The second bedroom also offers its own full ensuite bathroom along with a large closet! With tons of natural light, stunning flooring throughout and two and a half bathrooms, this incredibly designed unit is the perfect place to call home! The lower level units allow you to enter the open concept main floor directly through the front door and boasts rear south facing balconies. These units offer stunning laminate flooring throughout and with huge windows each one is filled with natural light. With a similar layout as the upper level units these units offer open concept living, dining and kitchen areas. The large living room provides enough space for any furniture arrangement while the spacious kitchen which features dark cabinetry, beautiful quartz countertops and stunning stainless-steel appliances. This kitchen truly has everything you could imagine including soft close cabinets, gorgeous tile back-splash, tile flooring and even a small countertop overhang perfect for a breakfast bar! Off the kitchen is a large dining room area with an overhanging light and access to a small balcony overlooking the rear parking lot. Together with a stunning half bathroom this main floor is an ideal living and entertaining space! Continue down to the lower level and find two spacious bedrooms each equipped with their own private full bathrooms! Each bedroom is filled with natural light through large windows and boasts laminate flooring and large built in closets. With tons of space, dual master bedrooms and two and a half bathrooms these units are guaranteed to impress!